SpyParty has earned attention over the years for being an intensely addictive, competitive game. What a lot of people forget is that SpyParty is also supposed to be a pretty game. 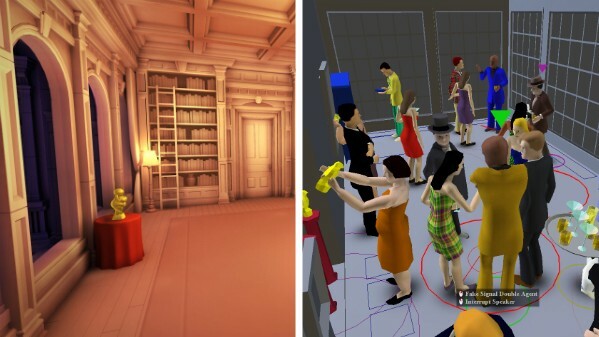 SpyParty mastermind Chris Hecker released a batch of fresh, updated concept levels today demonstrating the intended final look. These new environments join the updated character models that Hecker released one year ago and will oust the placeholder art that players in the beta have come to associate with the game. Hecker, and even some players, lovingly call that art "ugly." "I'm not ashamed to show my really ugly game because I'm really proud of the gameplay," Hecker tells me as we walk through the new screenshots over Skype. "If the game had looked like this when we first showed it, people would want to talk about how pretty it was, too, and that's just a distraction." The remodeled environments won't hit the SpyParty beta for a "very long time" (surprise), but Hecker and his development partner, John Cimino, will work on implementing the new art on a separate plane and then slowly roll it into the game. These images are rendered concept pieces, but Hecker says they're a "visual target" and he's hopeful the in-game products will be a close match. SpyParty is a showdown between two players, one as a sniper and the other as a spy at a fancy party. The spy's room is filled with AI characters chatting, walking around, investigating the host's books and art – standard fancy party activities. The spy attempts to blend in with the NPCs and complete assignments, and the sniper tries to spot the real person and shoot him before his mission is a success. It's so deeply detail-oriented that a fighting game buff from EVO is the top player. 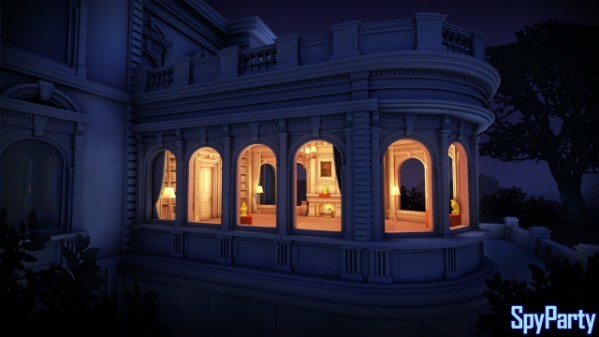 The new images show off two locations for spies to infiltrate, the modern home and the traditional mansion. Visually, each environment tells a story: The hot places, colored in orange and yellow hues, are areas that the spy inhabits. The cold spots, colored in blue tones, line the track from which the sniper peers in on the party, searching for the spy. Click through the pictures offering an outside-in view of each house to get a feel for how the sniper will move along the perimeter of the game. Think of it as a manual gif. Hecker launched the SpyParty early-access beta in June, charging $15 for a life of espionage, following a closed beta that began in 2011. SpyParty may make its way to Steam Early Access in the future, but only when the existing player base is large enough to stabilize any incoming trouble – the current community is a welcoming, helpful place, and Hecker wants to keep it that way. He's never had to ban anyone; the most he's done is send a few emails asking players to calm down and treat the game space as if it were their own living room. A sudden influx of players could ruin that carefully cultivated player base. Since opening the early-access beta, SpyParty has drawn in 10,000 registered players, and Hecker celebrated the quintuple-digit mark on Twitter this week. Two tweets later he reminded followers that Minecraft had sold 15,741 copies just that day. Minecraft popularized the early-access beta model and Hecker recognizes how that impacts his own plans, but he retains perspective: "You don't want to compare your game to Minecraft because that's like comparing your game to Doom in 1994." SpyParty will remain in beta for as long as that system pays the bills, and as long as Hecker is improving the game. People are still buying Minecraft, for crying out loud, and with the entire internet as his potential market, Hecker sees the early-access system as an "infinite runway" to perfect the game. "The internet is really big; it's insanely big," he says. "SpyParty is pretty weird, but there are even weirder games, and you can sell them online nowadays and make a sustainable living – and that's the goal. The goal is not to get rich; the goal is to keep making games. It's just not that hard to do that if you have a good, quality game now. It's great." It is great – as long as that "infinite runway" isn't actually infinite.